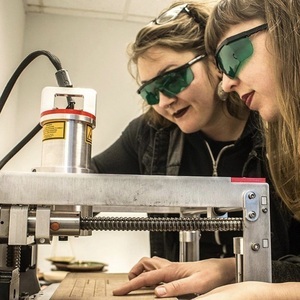 What started as a personal studio for co-founders Erin Gatz (Oldynski) and E.Louise Larson is now a feminist makerspace. Prototype PGH was born from the idea that we are constantly prototyping the kind of world we want to live in. As two women who love making, educating, and Pittsburgh, this is our first prototype for the future. Help us find and move into a larger space, ideally on Penn Ave in Garfield. We are seeking an accessible space with room to add more equipment and provide space for our maker-incubator. To help coordinate our efforts to move, we will also need help building and running a crowdfunding campaign. This includes making our ask video, creating supporter levels, and making campaign gifts. Buy us something from our Amazon wishlist!